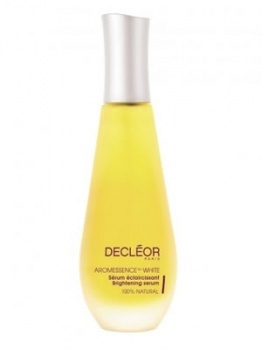 Decleor Aromessence White Brightening Serum is specially formulated for the daily care of dull skin and areas of pigmentation, this 100% natural and active silky serum with an uplifting scent boosts the effects of our intensive Aroma White C+ range. It contains the Essential Oils of Parsley to lighten pigment spots, Lemon to brighten the skin and reduce blemishes, Roman Chamomile to calm and enhance the skin’s natural defences , Acacia to leave skin smooth and more radiant and Wheat Germ to stimulate cell renewal. Dark spots are visibly reduced and a more luminous, even and transparent complexion is restored. When paired with Aroma White C+ − Intense Translucency Fluid as part of an Aroma Duo, complexions were found to be 93% more radiant*.